Step 1. Start up VS2013 and click on the Help menu. Choose the Register Product menu item to open the Product Information dialog. Step 2. With the Product Information dialog open, click on the Sign In button. Step 3. 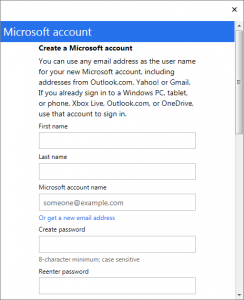 The Microsoft Account dialog will now open, as seen below. 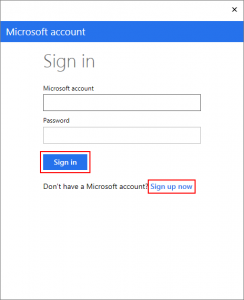 If you already have a Microsoft account, click on the Sign In button and go to Step 6. If you do not have an account, click on the Sign up now text and continue onto the next step. Step 4. Clicking on the Sign up now text presents us with some text boxes to fill in. Enter the appropriate information for each text box and continue onto the next step. Step 5. 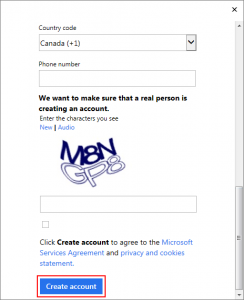 With everything filled in, scroll to the bottom of the Microsoft Account window and click on the Create account button. Step 6. 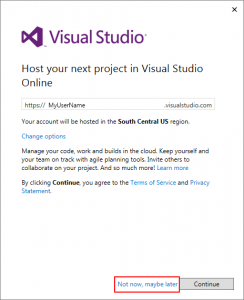 After signing in or creating a new account, we will be asked about saving Visual Studio projects within the Microsoft online cloud. We can skip this by clicking on the Not now, maybe later text. Step 7. 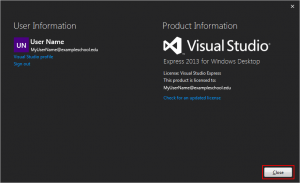 We will now be returned back to the Product Information dialog where we are told that VS2013 is now registered. 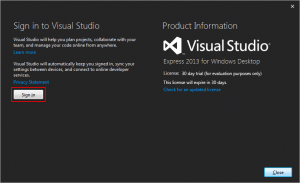 Click on the Close button to return to the main VS2013 interface.